The air quality in Los Angeles, when I lived there, was less than desirable. But it did make for intensely colorful sunset walks. Surreal shades of crimson and ocher would wash over the trails and agave rosettes dotting the hillsides near my canyon residence. 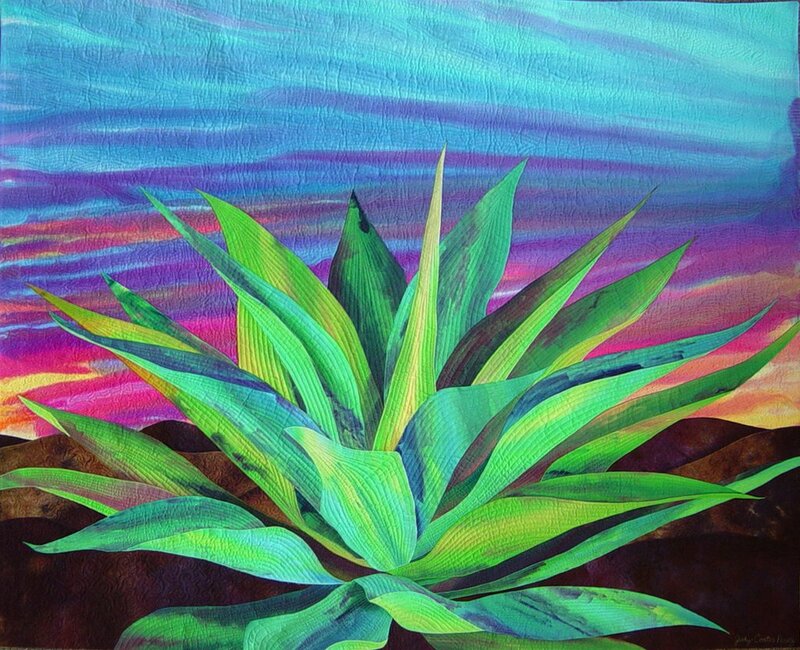 This quilt was inspired by one particular agave plant that seemed to capture the setting light in a way that made it glow with a regal luminance. Stem cell research is getting amazing results in a number of areas in the medical field. I am frustrated by the belief system of this administration when it comes to stem cell research. 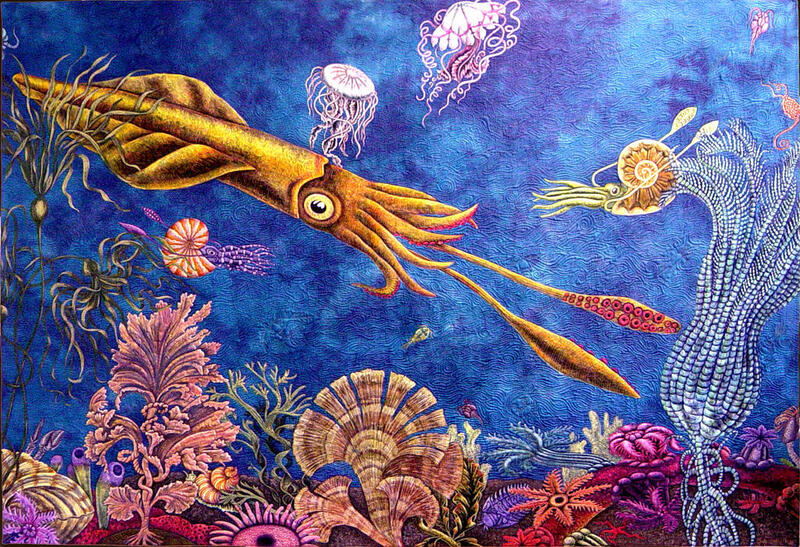 At the present time fertilization clinics dispose of unused eggs. Why is it more humane and Holy to throw away embryos than donate them to research that could potentially save lives? 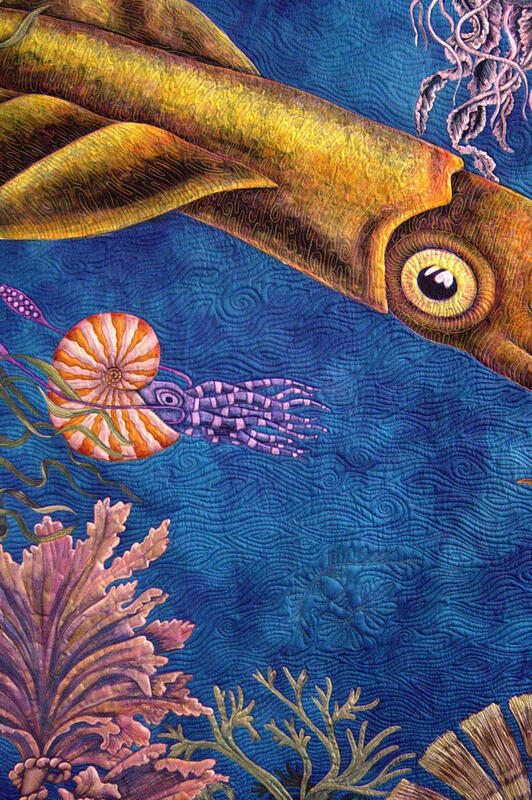 While living in Texas fossils fascinated my children, and we spent many happy days in the creek beds of Austin searching for evidence that North America was once under the sea. This quilt is what I like to imagine a Primordial Sea, abundant in jewel toned marine life would look like. 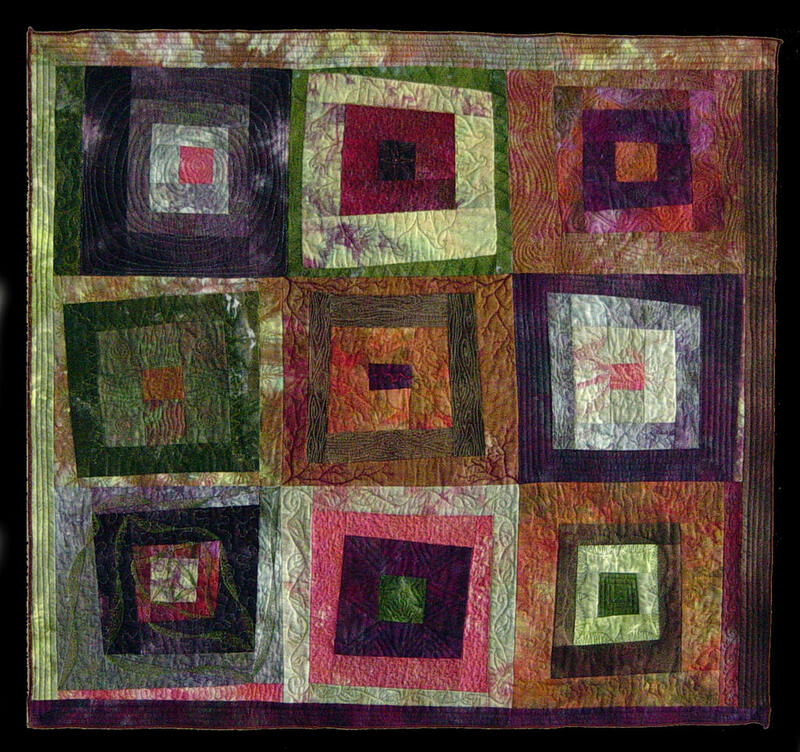 If you would like to see how this quilt was made look in the May Archives. 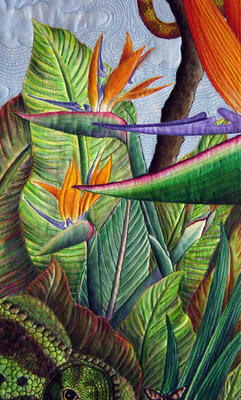 and Second Nature is going to be in this years IQF In Full Bloom exhibit. 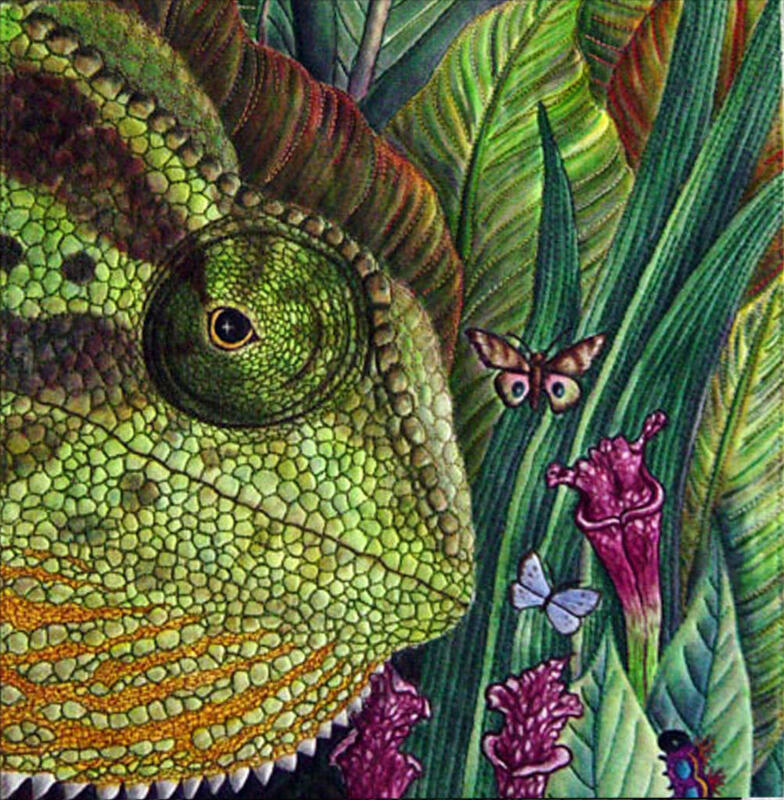 this piece is painted with Tsukineko Inks. 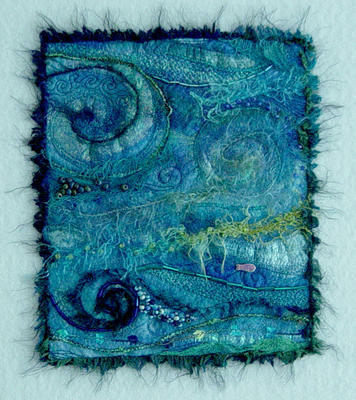 This was my donation to the IQA auction last year. It is painted silk. 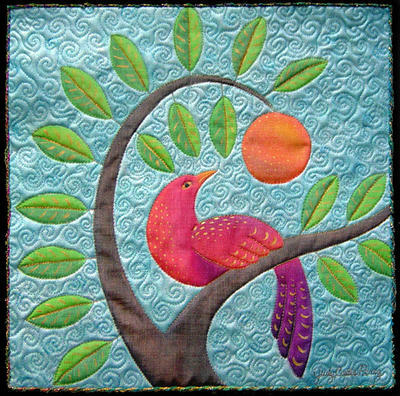 The sky was painted with textile paints and the bird and tree were painted with Tsukineko inks, with gold metallic paint details. The edge is finished with couched colored and gold cording. I like to use other things besides traditional bindings to finish the edges of my work. I wish I knew who bought this. I like to know who my work is living with. Looking at Mars mission photos, I was struck by the contrast between scenes of a rocky, lifeless planet and the rich, fanciful portrayals of Mars in popular culture. I prefer a fanciful Mars. 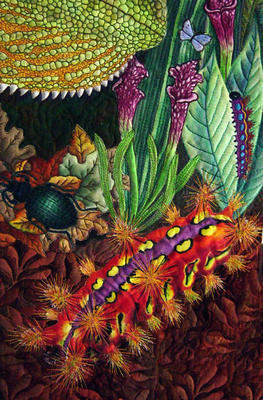 A place, where flora and fauna from the pages of Ernst Haekel’s book, “Artforms in Nature”, fill a Ray Bradbury inspired world and a 50’s Sci-Fi alien femme fatal watches a song, sung by my sister in girlscout camp to the melody of “The Snake Charmers Tune”, weave it’s way though the landscape. My sister, who's work you can see on my links, learned this song in Girl Scout camp when we were kids in Maine. the song goes like this. where the ladies smoke cigars. is enough to kill a snake. they put roses on its head. they put diamonds in their eyes. I love to hear when some one else knows this song or a close variation (not the one about france and ladies under pants). When I was in Houston I had people from all over New England, upstate New York and Pennsylvania tell me they learned this song in the early 60's. Another woman from Tennesee jumped rope to it in the late 50's. It was also known by someone in Colorado and another from Southern California from the late 50's. A woman from New jersey said she knew it with tulips and I think it ended in 1969. 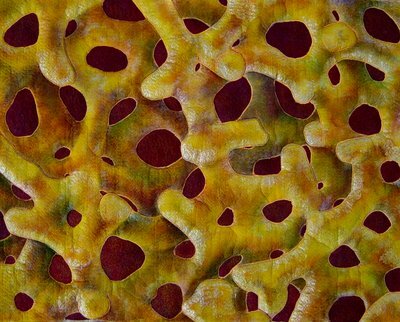 My son had a fascination with lichen when we lived in Texas. It was everywhere in so many different beautiful forms. 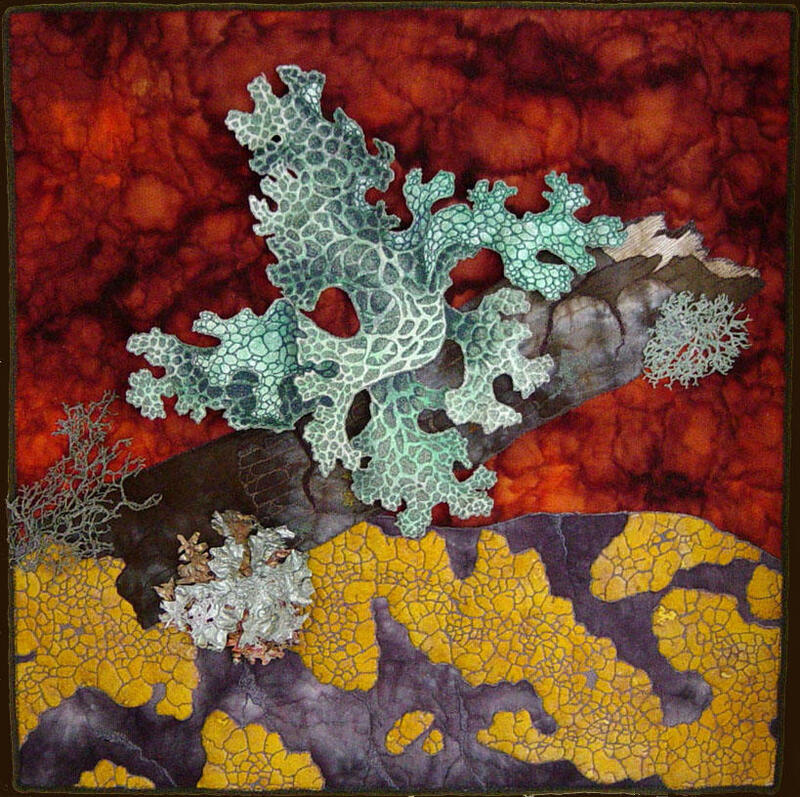 Lichen is a class of organisms in which algae and fungi live in a symbiotic relationship as one. 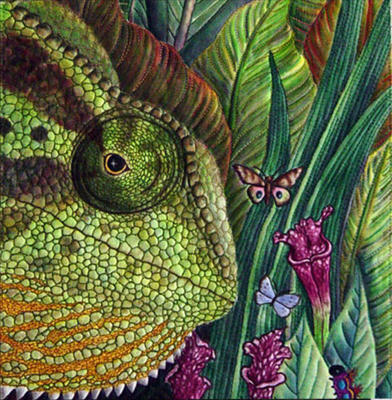 They are found throughout the world but are unable to survive where the atmosphere is polluted, so they are good indicators of clean air. 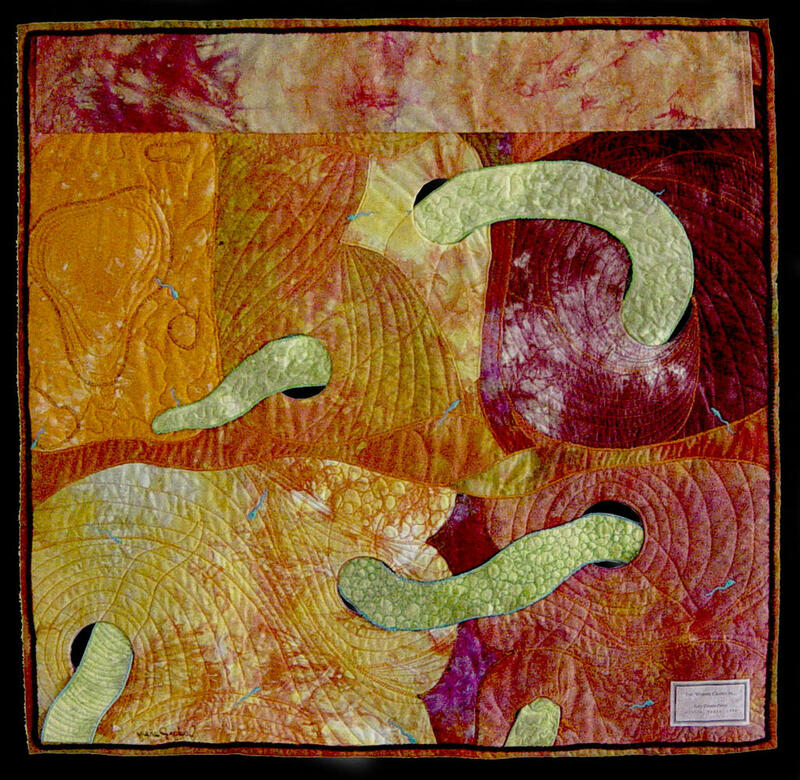 The large lichen on this quilt was made by painting cotton batting and stitching the texture into it. The edge has a fine gauge wire sewn into it to give it form and dimension. The yellow lichen is painted cotton batting. 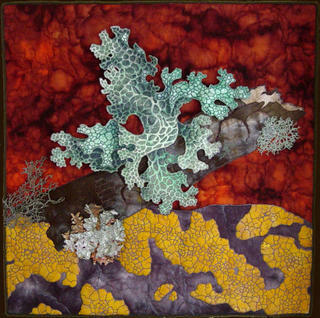 The smaller thread lichen were made by stitching on Solvy. The other lichen is painted and melted Tyvec. I was happy to find that the batting did not soak up the paint like a sponge, and they were easy to stitch and couch on by machine and bead by hand without falling apart. 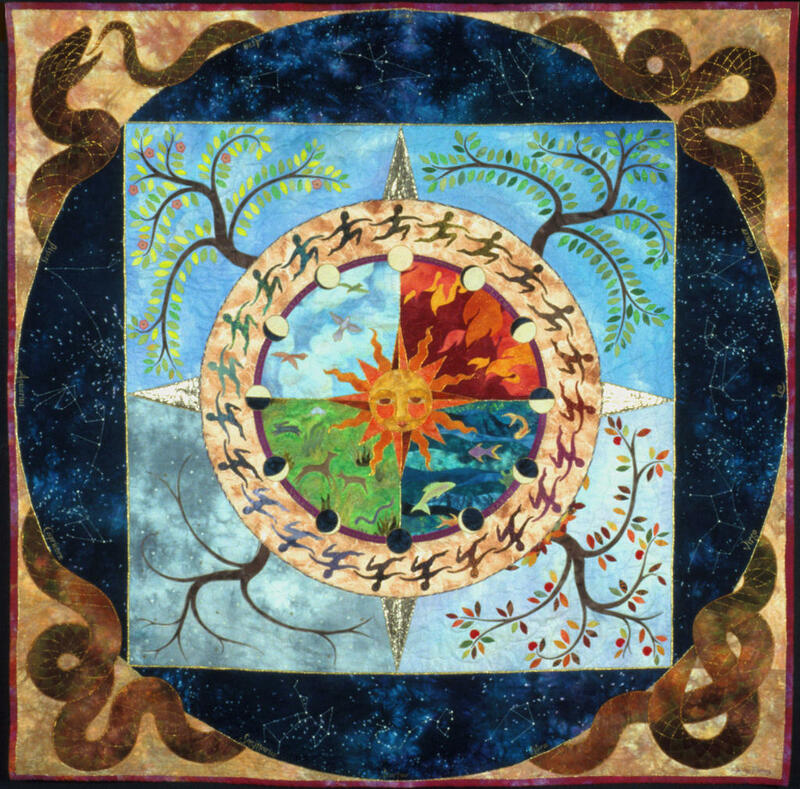 I was drawn to creating an image of the Tree of Life, which is a creation myth from many different cultures. 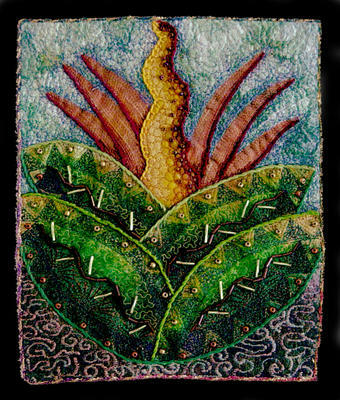 The universality of this symbol was important to me as well as the idea that the location of the biblical Eden is in present day Iraq. 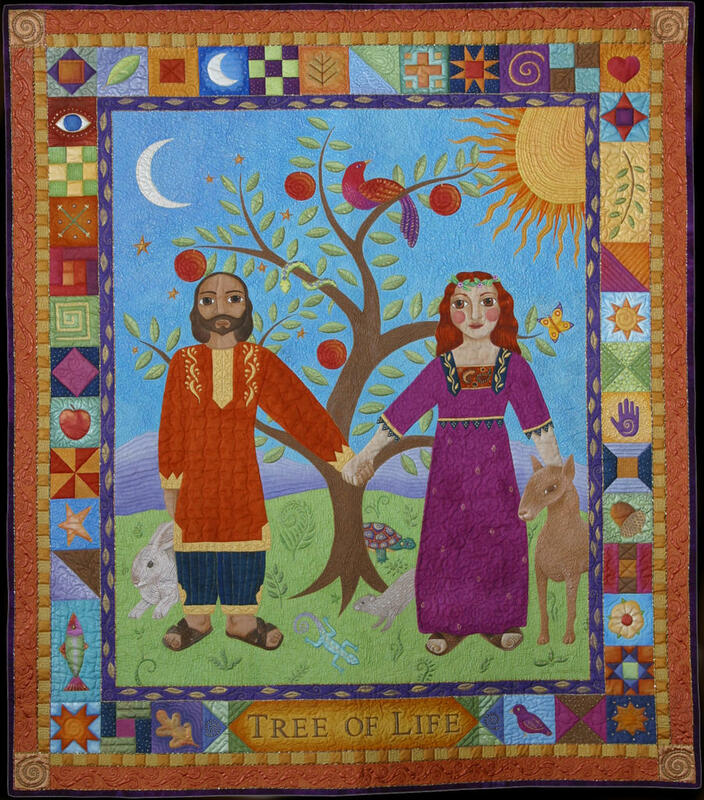 I wanted my quilt to have the quality of a multicultural folktale using symbols from nature and various religious traditions. 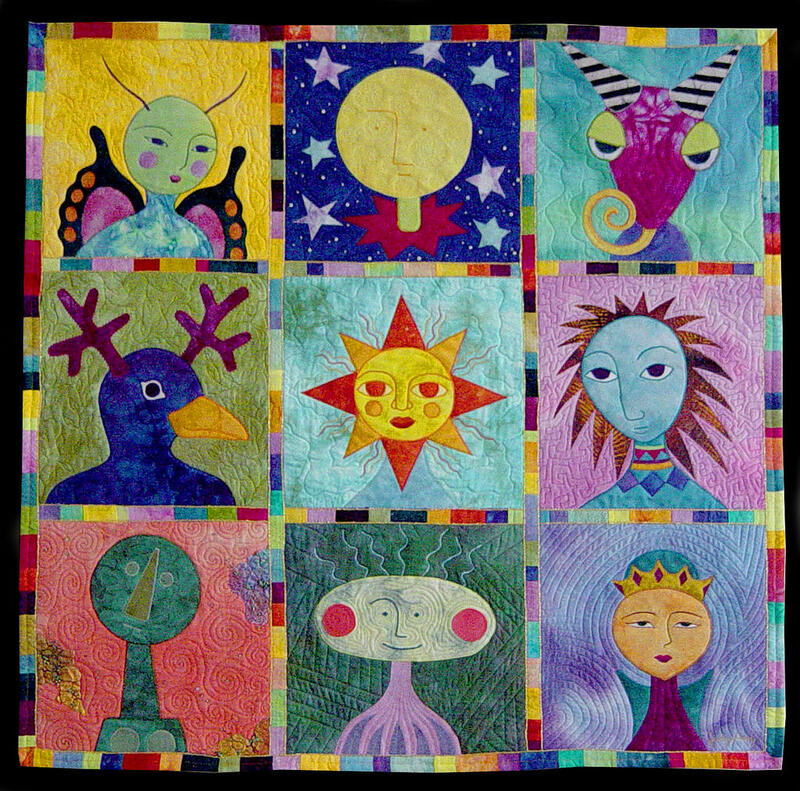 It is a whole cloth painted quilt, using Jaquard and Lumiere textile paints and Tsukineko inks for the faces, hands and feet. This quilt is part of the national traveling invitational exhibit "Women of Biblical Proportion" curated by mother and daughter team, Ruth Harris and Chantelle Cory. 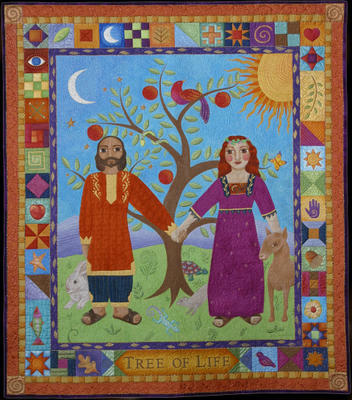 "The exhibit portrays the rich diversity of female biblical characters through contemporary art quilts. 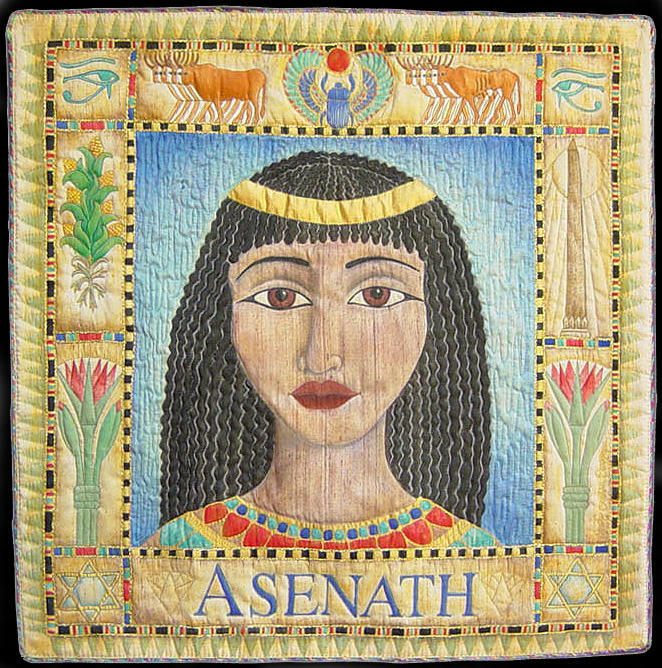 I chose Asenath, she was Josephs wife, as in the well known “Josephs Technicolor Dreamcoat” She was the daughter of an Egyptian priest. Asenath was also of interest to me because this is my sisters middle name. 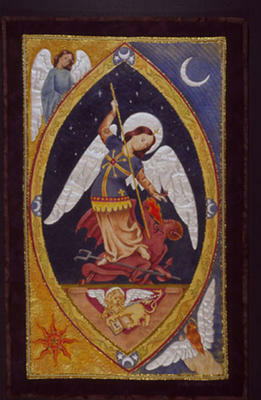 The central image on this quilt is from an engraving from the renaissance, called St Michael overcoming Evil. When I saw this image it brought to mind our present history; one that President Bush has drawn parallels to by referring to our fighting the axis of evil. Tsukineko inks were used to paint the main images and backgrounds. The wings are painted with Lumiere paint. And colored pencils were used to add subtle shading to the oval border. 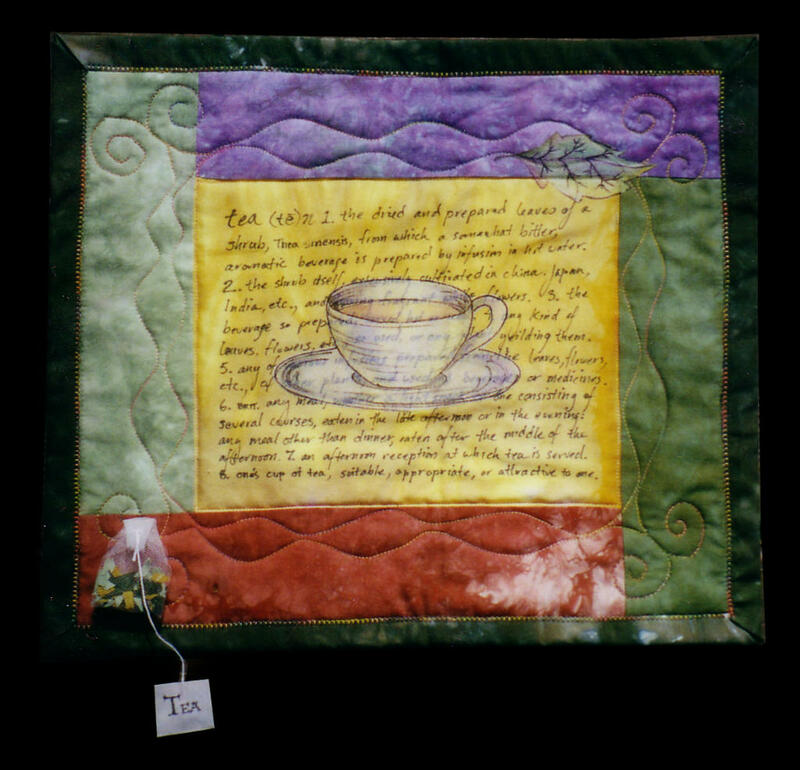 This small quilt was the first piece I painted with the Tsukineko inks. It is whole cloth, machine quilted and embellished with beads and gold cording. One day my daughter Nina mentioned that I had never done a quilt with a leopard on it. 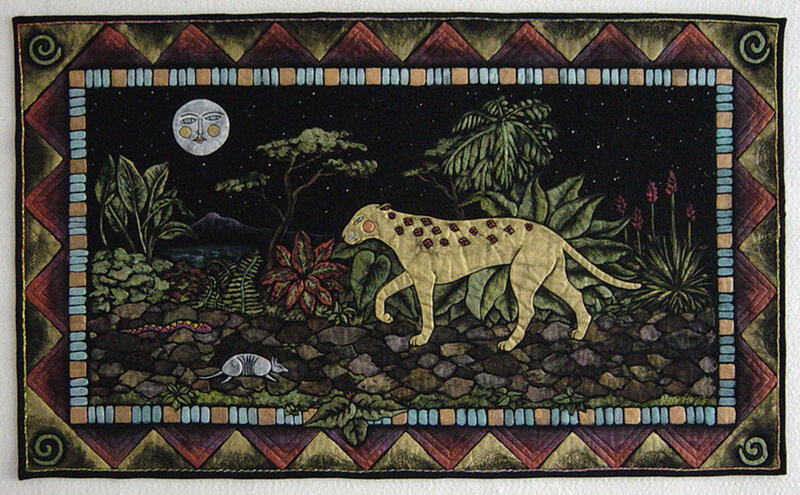 I decided to humor her and painted an image of a leopard on a moonlit walk through a dark and mysterious jungle. I realized I was trying to capture a quality I sometimes see in her, which makes it a very special quilt. I was inspired to make “Graven Images” while visiting cemeteries in New England, following up on some ancestral research. I found the symbols and images carved into the various stones fascinating in design, symbolism and historical context. 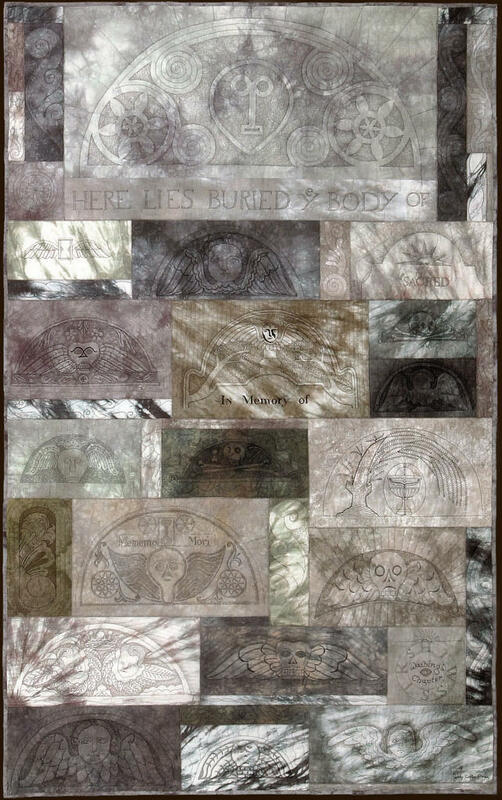 Wanting to recreate the look of stone in cloth, I hand dyed fabric in shades of gray using various techniques to emulate stone. 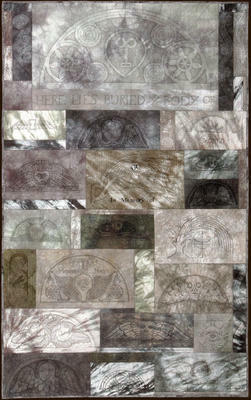 I enlarged my photos of the stones and traced the designs using tracing paper. I put my dyed fabric over the line drawings on a light box and traced the designs with pencil. The images were free motion quilted onto fabric and batting sandwiches creating dimensional images as though carving them into the fabric with needle and thread. Colored pencil was added to the recessed areas to create more depth. After the panels were quilted I trimmed them and arranged them filling in any holes with small strips of quilted carved stone details and pieced them together. 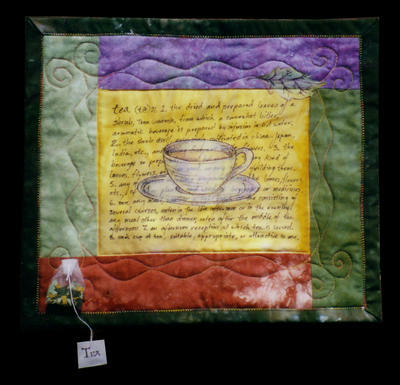 The most haunting aspect of making this quilt was that after working on it, on and off for two years quilting the various panels, I spent 3 straight days piecing it together and began putting the binding on it the morning of September 11, 2001. 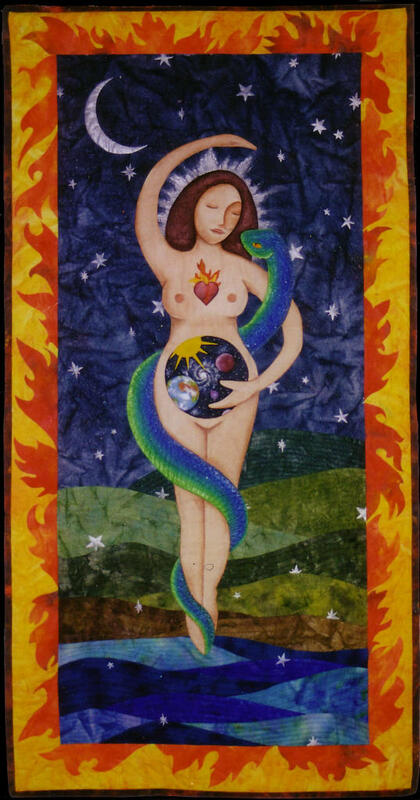 I found this to be so unsettling; I did not feel comfortable showing the quilt for a year. This was the first quilt I entered into the IQF show in Houston in 2002, it won Judges Choice and 3rd place Art Quilt Large. 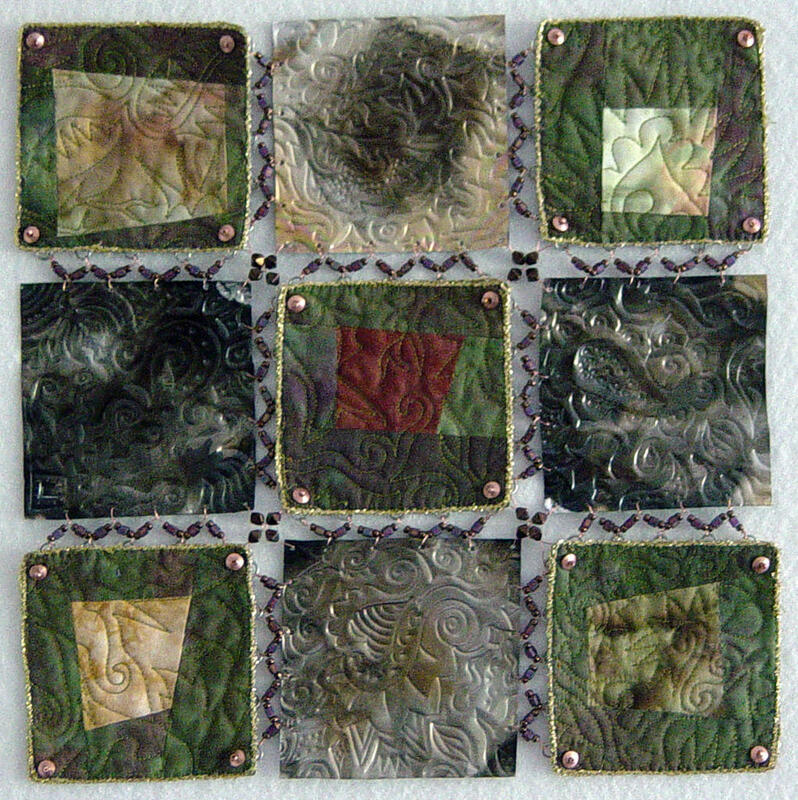 I started making a series of heads on 12” square pieces of fabric. 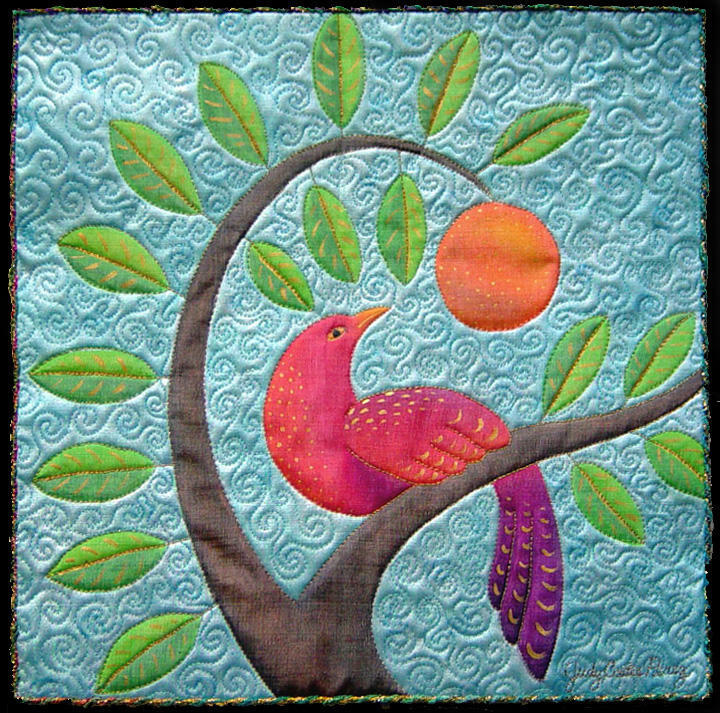 The images were machine apliqued onto the background fabric. I used some commercial fabric but mostly hand dyed fabric. 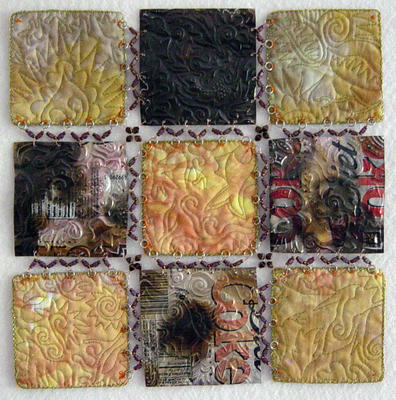 The butterfly wings have clear micro beads fused onto the pink areas, and the head in the bottom left has some painted and beaded Tyvek on the edges. 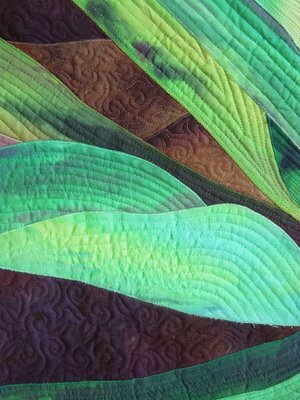 Each block was quilted individually and then sewn together with a wide satin stitch that was covered by a fused sashing strip with the edges couched with gold cording. 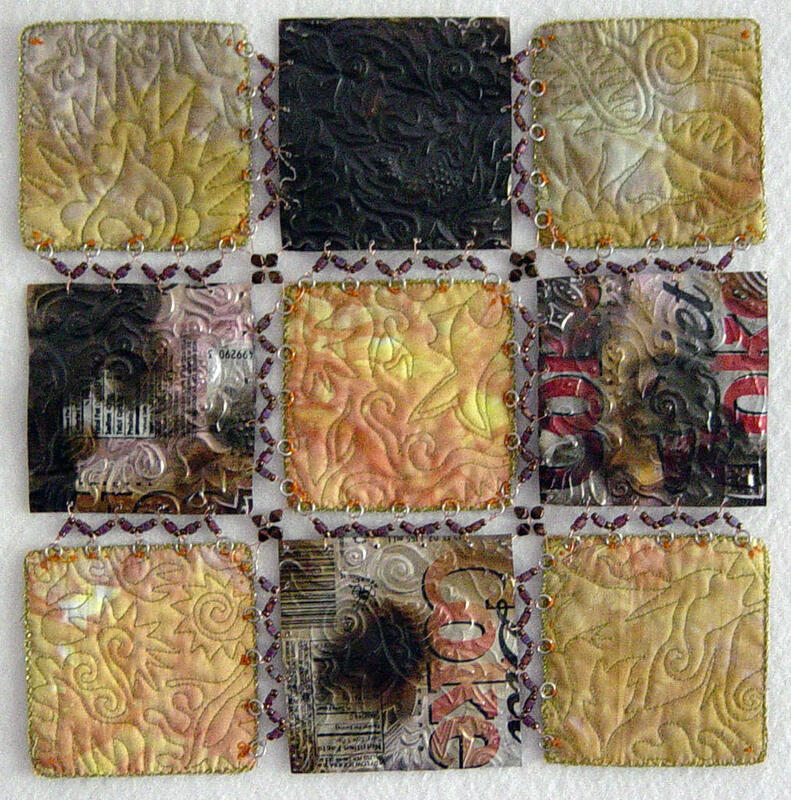 This quilt was the second in the series, this expanded on the idea of language and the different things one word can mean. 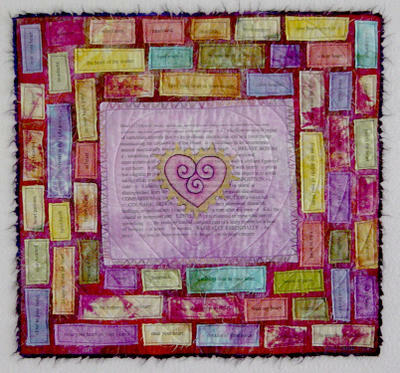 The definitions of the word heart is in the center of the quilt. 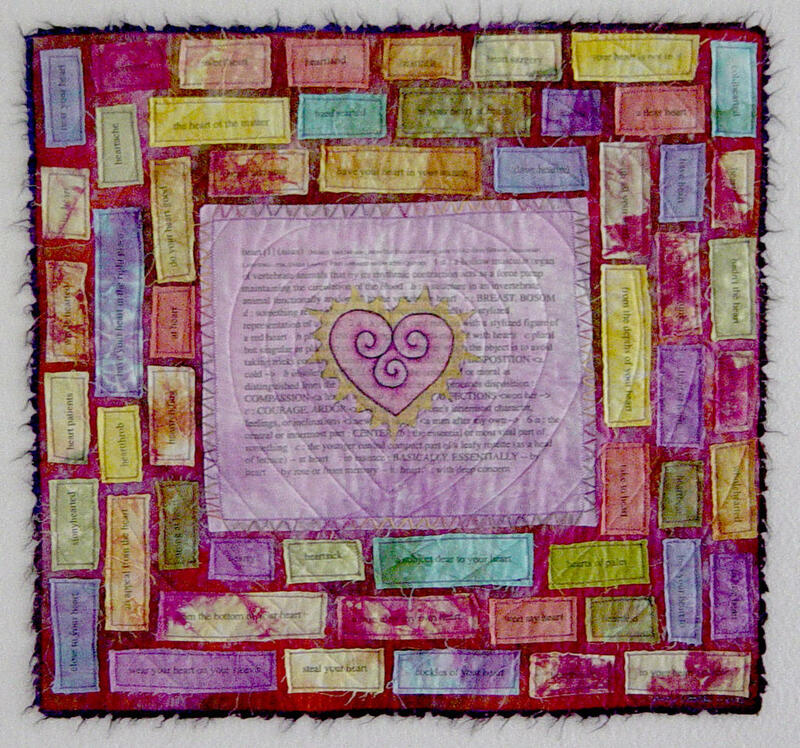 The illustrated heart is made from fusible interfacing, colored with Prisma brand colored pencils. 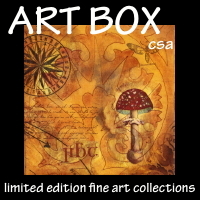 Surrounding the central image are all the related idioms such as heart sick, heart throb, and whole hearted. I transferred the type onto the fabric using Citrasolve from toner based laser prints. I wanted to experiment with dimension on this quilt, and see what would happen if things broke the surface and went through the quilt. 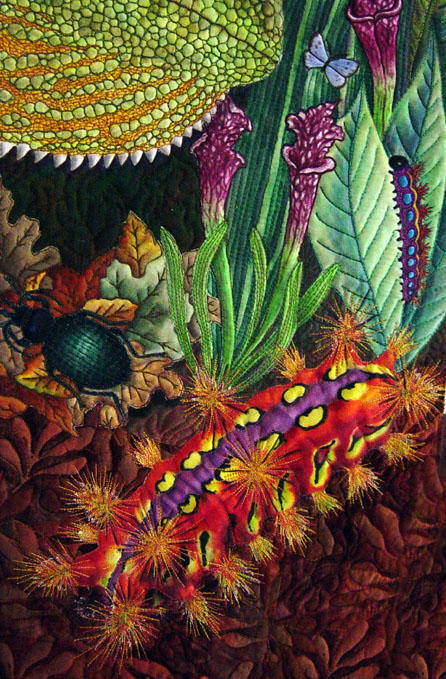 There are wholes in the quilt that the worms crawl through, you can see this clearly on the back of the quilt. There are also a few shapes that are stuffed with several layers of batting. 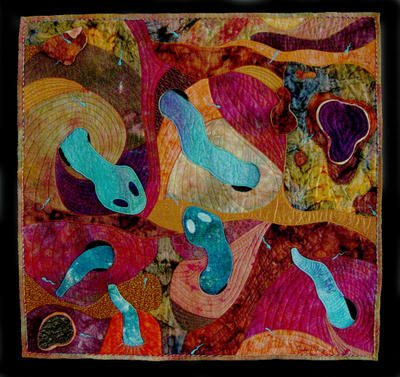 My good friend and surface designer Kathy McTee from Austin referred to one of these shapes as a cosmic steak. My worms really resemble nematodes, but that would not have made as nice a name. 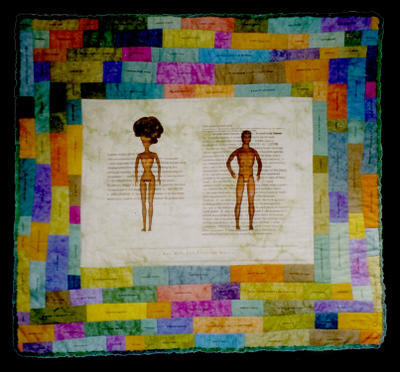 When I made this quilt, I wrote this prayer to go with it. 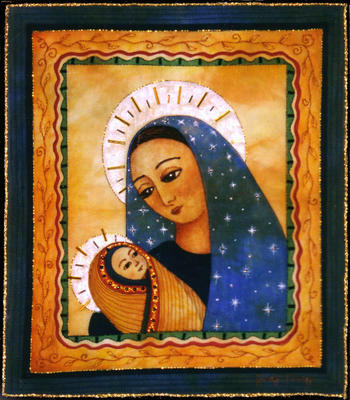 we celebrate with your many names. 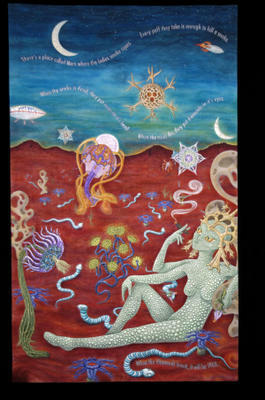 life is born, grows, dies and is reborn. the cycles and rhythms of nature. so should the inspiration of new ideas. celebrate the abundance around us. and the healing power of dreams. 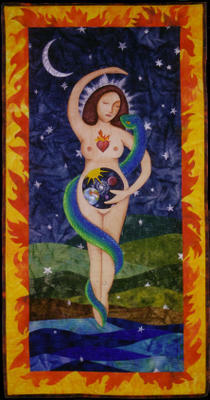 keep us in balance as our bodies cycle in harmony. and celebrate your abundant beauty. 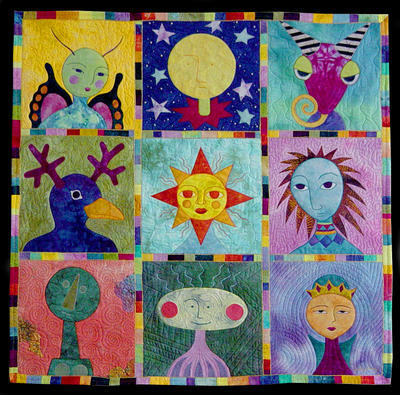 This quilt was used as the theme of a March of Dimes benefit in Austin, TX called A Stitch in Time, as the featured art is was auctioned off and half the proceeds went to the March of Dimes. 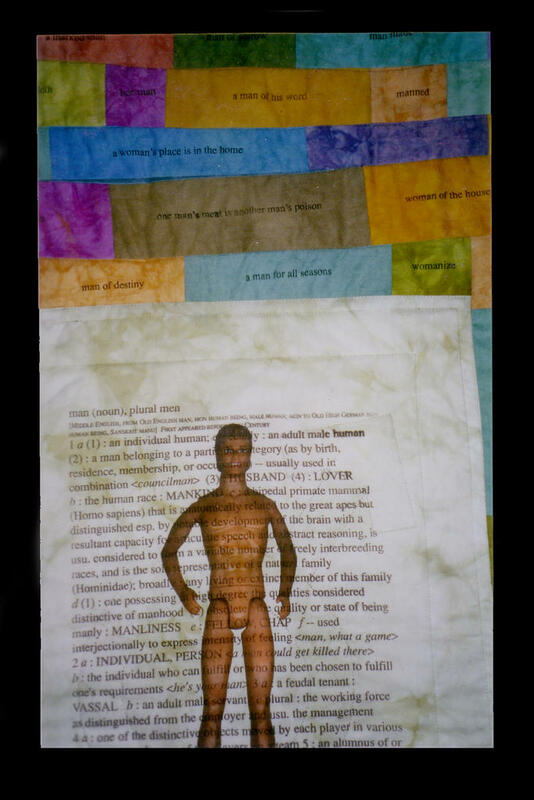 I am very happy that it is in the collection of my good friend Frances Holliday Alford. I think Joan of Arc was an interesting figure in history; courageous, spiritual, devout, used for political gain and wrongly condemned. 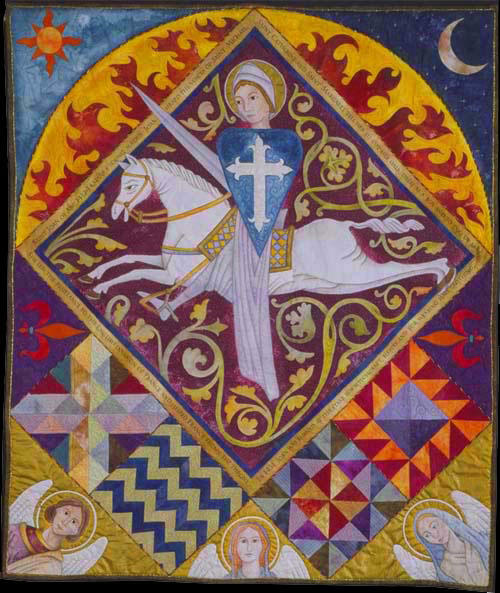 Joan and the angels are painted with textile paints and colored pencil. All of the cloth is either painted or hand dyed, It is machine appliquéd, pieced and quilted.